Do you have a problem with your concrete block foundation? You may be able to repair small cracks and other minor damage yourself. Find out when a DIY fix is just fine, and when you need to call for professional concrete repair. Concrete Block Foundations: What Causes Damage and How to Repair? Water causes most foundation problems. Poor drainage and seasonal soil expansion can damage a concrete block foundation, but the damage is not irreparable. Some small cracks and minor water problems have DIY repairs. On the other hand, professional experts should tackle ongoing problems and any larger cracks with either bracing or full reinforcement if the wall is displaced more than one inch. Small foundation cracks may be the result of harmless settling or natural concrete fractures. If there is no bulging or horizontal displacement, just seal the crack; scrape away any rough mortar and make sure the walls are dry, then add mortar and concrete caulk. Moisture in concrete block foundation walls or flooring may be a larger problem, but it might just point to soil grading problems. Make sure water flows away from the house. Secure your gutters and extend downspouts to ensure rooftop rainwater drains at least five feet from the house. Also make sure soil drops away at least six inches in the first 10 feet from the home. If the cracks and moisture return after your DIY efforts, it may be time to call a professional. Large cracks, bulges, and tilting in concrete block foundations need to be either braced or excavated. Bracing and excavating are both jobs for experts in sealing water problems, repairing cracks, and shoring up foundations. A bulging or bowed wall in any winter climate is typically caused by the expansion of freezing soil. The middle of the wall may crack at the frost line. A poorly built mudsill can combine with lousy drainage to tilt the top of a wall inward. Finally, poor drainage can undermine the foundation and tip the bottom of the wall inward. Reinforcing concrete block foundations with concrete and rebar. Experts can thread steel rebar into existing concrete blocks, and fill the blocks with new concrete for greater strength against water pressure. A block is also typically nailed to the joists to keep the top of the foundation walls from tipping inward. Adding steel columns. Have a pro add steel columns as bracing. The columns should be pushed against a concrete block foundation, and then bolted to the joists and slab every three to four feet. In either case, a licensed engineer must design the bracing. More than one inch of displacement is typically a trigger for serious foundation work. The ground must be excavated around the foundation so the wall can be jacked back into place and plumbed. After replacing the mortar in any cracks and resetting the foundation wall, make sure the wall is coated with asphalt cement and plastic sheeting. To avoid future problems, repair and improve the drainage system before backfilling around the foundation. 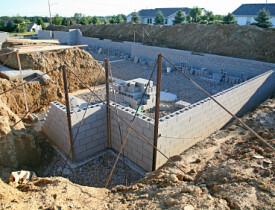 Hire a reliable professional to take care of your concrete block foundation problems. This article was updated November 19, 2017.